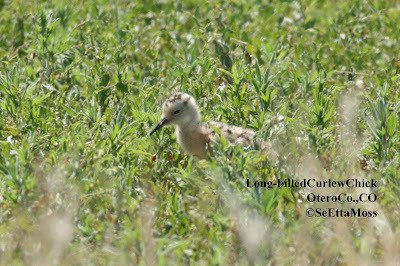 The mother curlew is near the chick in both of the bottom pics as it forages in the grassy area (actually a lot of forbs). According to Nature Works, "Shortly after birth their parents will lead them to the feeding ground where they will hunt for invertebrates like grasshoppers." This very young chick was quite independent and spent little time near either of it's parents during the almost 2 hours I observed them. Yesterday I took advantage of a 'cool' front that dropped the temperatures in Otero County from around 100 to the 80's. 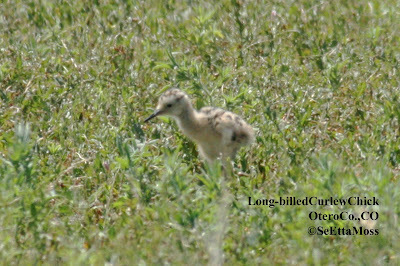 I returned to look for the Long-billed Curlew pair that I found last year with several chicks. I found the male and female in the lower pics only about a half mile from where I had seen the pair last year so believe this is the same pair. Actually the grass in the field where I saw them the most last year was in poor condition--there is a severe drought in that area plus it appears the ranchers overgrazed those fields (grass fields right across the road were short but healthy looking). 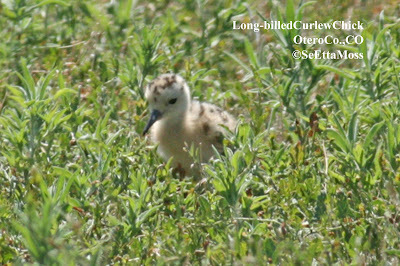 Long-billed Curlews are known for nest site fidelity but I suspect the poor condition of the fields they were in last year prompted a move down the road.